For the third time since last September, our cat Tilly displayed curious behavior indicative of a urinary tract infection. It began Sunday afternoon as happened on December thirtieth last year. Once again, I got lucky making a same day veterinary appointment. The first time, dear readers may remember we chose the Convenia antibiotic shot as we left for our autumn vacation before receiving diagnosis. Our pet sitters, a wonderful couple, handled her care. Upon the second occurrence, I requested tablets. To my surprise, the vet that New Year’s Eve day told me they are more effective against the average UTI than a one time shot. It would have been nice to know earlier, but we had no real choice in the matter anyway. The pet sitter prefers not to administer oral medications after a nasty dog bite. I can’t blame her. This past Monday, I got a more disturbing surprise. For an additional $95, a urine analysis on the specific bacteria will allow us to better target treatment. Why didn’t they offer that months ago? I wonder if past treatments never even cleared her of whatever bacteria strain’s plaguing our poor darling, resulting in these uncomfortable reoccurrences. I’ll have you know, I kept my cool in the examination room and beyond, until returning home and raving to my equally bemused DH. Meanwhile, I spent over $300 and still have to purchase more of whatever pills are recommended. And for now Tilly endures not only her preliminary antibiotic twice daily on top of the regular thyroid medication, but also ear drops and a liquid oral pain medicine morning and night, as well. I must admit, the mild sedation of that last seems to bring us more peace and quiet until she decides it time to demand another serving of canned food. Tilly is spoiled, and loves pestering my husband for attention. And thank heaven, goes into peaceful sleep on his lap every afternoon. Now, let’s hope the ear drops clear up some mild irritation and reduce her wax overproduction. A call should confirm our next step toward her UTI in a day or so. Meanwhile, her blood work otherwise showed the feline in good health, especially considering her age. 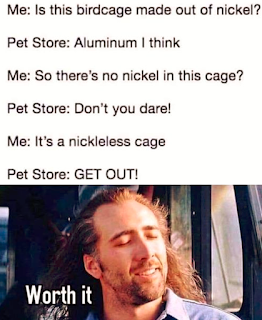 That’s a relief. If she suffered kidney dysfunction, antibiotics could be prescribed for up to six weeks (!) as opposed to two. Unless someone goofed up reading reports on our phone message, she won’t need that. We have been given false hope with a past error. Wish us luck. Are you aware that people not completing a prescribed course of antibiotics is a contributing factor toward the emergence of resistant bacterial strains? I have struggled leaving the house ever since our car accident. Kudos to my husband, who prefers not to drive, for stepping up and going by himself on a few occasions for groceries and whatnot. But this is not how I want to live, however mean the world outside can be. Going to see a physician on Monday proved to be a positive step forward. Took me three weeks to get an appointment, but learning the occasional stress induced chest pains are just that, nothing serious, and making a plan to get out of this anxious rut got me back to the gym. This morning’s resistance training is my third for this week and proved to be my 462nd total (!) since joining the YMCA a few years ago. Following my checkup I agreed to go on a super low dose anxiety medication, perhaps just for a few months. We’ll see how it goes. My husband encouraged this, in fact, which told me how much my condition upsets him. He hated when I took Abilify and some anti-depression pill or other years ago, saying they dulled my wit and personality. In 2012 I left my stressful job in exchange for going off the stuff. I never saw this attending doctor before Monday (so much for keeping your regular doctor through the health insurance marketplace). He and his fellows are working toward residency under guidance of senior physicians including my husband’s longtime doctor. I liked him. He asked about my dreams. Any nightmares? To that he offered another medication formulated to ease symptoms of an enlarged prostate. Yes, you read that right. Mine is an off label drug use, with potential of lowered cholesterol and reduced nightmares as possible side effects. So, again, we shall see. The pharmacist warned me about the drug’s main purpose, as if I didn’t already know and would be offended. As if. I find it all very amusing. My entire adult life I’ve felt like a seventeen year old boy resides in my brain. Why not a fifty year old male? Maybe ‘he’ grew up alongside me in strictly a physical sense and developed prostate issues. My husband found that notion hysterical. Meanwhile, as I prepared to park near the pharmacy, a nasty driver honked at me for driving too slow. In a parking lot, as I drove behind a pedestrian. Nice, huh? But the joke’s on them because my anxiety level was high enough the honk barely caused a bleep on my mental radar. This afternoon I’m happy retreating into my fiction. Editing to ‘The Crow’ soundtrack has been therapeutic. I’m about to get back at it while rocking out to band Black Light Burns. What is your preferred escape from reality? With a little help from my husband (ahem… I’m hearing a certain Beatles song here), I managed to personalize our Volt 2.0, the Blue Meanie, with two of her namesakes. The submarine gave me the biggest problem because I did that one by myself. It’s a little disappointing that it has a slight front end tilt because I let the turret and steam stack stay attached while resettling the lifted hull. And there are a few tiny bubbles. Oh, well. He said we could always order another sticker if I feel the need. Doesn't that car antennae look like it belongs on a submarine? Or a shark? He had the wise thought to hold the bottom half of the larger sticker away from the window while I started with the ‘bunny ears’ and smoothed downward using a credit card. That one went on like a charm. Are you seeing sunny weather today? Rather than reply with a facetious query as to who else might have, I concurred. And no. We didn’t import those spiny mammals into our menagerie. 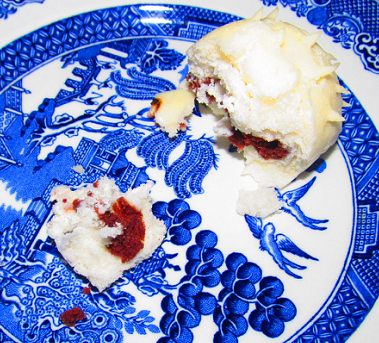 The last time we shopped the giant international market, Jungle Jim’s, I found these cute Japanese red bean filled buns in a representative shape. They weren’t expensive, so we brought a box home. Sad to say, the texture proved a bit dry, though I appreciated the lack of extreme sweet featured in most Midwest treats. With one left and freezer burn setting in, this lonely critter got set out on a plate to thaw. They had been microwave heated in past, a tricky balance of defrost and high settings. Alas, this countertop method dried out the little guy further, though I’m sure the frost visible on its tiny intact head didn’t help. As you may know, the plate beneath bears the Chinese Blue Willow pattern first popular Stateside in the 1920’s. A fan since childhood (not the Roaring Twenties), I requested a few place settings for our wedding. Selected for special occasions, they saw zero use. For everyday wear and tear, we stuck with his old CorningWare set from long distant college days. A few years ago I admitted having grown tired of that blue flower pattern and gained approval to choose anew, the old decent set donated to charity. Knowing from reviews that these new bowls would be too tiny for salads, I decided to pull out some more befitting from, you guessed it, my Blue Willow cabinet. By the way, I bought additional recent manufactures from a kind colleague and avid antique collector, adding to our original collection despite their lack of usage. Anyway, the bowls brought into rotation saw not a single breakage. Oh, and I once broke a plate from our old CorningWare. Shards appeared for years. To my chagrin, the same hardiness could not be attributed to the newer CorningWare. After a few months the cute simple swoops became damaged, dulled and disappearing in increments quite unlike those vintage blue flowers. Looking at our stack of nice untarnished bowls made me decide to replace all that increasingly ugly dishware (to which food tended to cling throughout various dishwashing cycles, I might add). The rest in storage, one now serves as a water catcher for my Christmas cactus. Wish I had a use for the rest, not much fit for charity. The China from my former coworker, made in the home country, show more white between the central and edge designs while our original pieces (as shown above) came from England and have a tighter configuration. All are servicing well, holding onto their designs and shrugging off food stains. Did you know the term ‘blue plate special’ is thought to have originated with this design’s popularity? Mean, yes. Also fun and colorful! Since we have a collection of plush and plastic sharks honoring our favorite vacation spot, I suggested maybe trying to find a Blue Meanie plushie. That idea fell by the wayside when he found them costing $50 and, in addition, I didn’t want to crowd out the sea life. Another idea came to me, and I ordered vinyl stickers, including the one above from Redbubble and this below. I hope they hold up well as the one we had on our last Volt, again advertising our love of North Carolina’s Outer Banks. 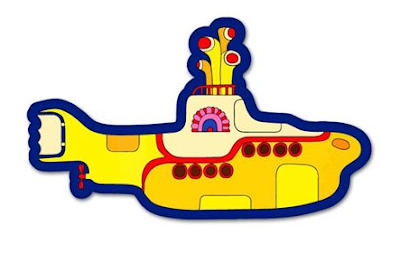 Have you ever seen the psychedelic film “Yellow Submarine”? Let me start at the beginning before explaining this post’s title. This morning I struggled with something that should have been one of the little joys in this life. A new compact disk came in the mail and I uploaded the album to my laptop endeavoring to sync my iPod Touch with iTunes. The normal opening steps achieved, the last failed, communication between linked software evaporated. Grabbing my trusty old iPod Classic and its cord, I hit pay dirt. The album loaded in less time than it takes to turn on my computer. What the heck? Software and both hardware devices rebooted, follow-on Internet tips explored, and several more attempts provided the same failed results. Following the fourth or sixth (?) failure my husband returned from a routine doctor appointment. Ever the mensch and longtime computer expert, he offered to help. Sent links to additional suggestions confused me more until he took over my laptop and iPod, me standing over his shoulder. Together, we finally solved the issue. He managed to pull up a Touch settings popup window in iTunes. There, I discovered a checkbox preventing a sync with the entire library. Since my newest album was not selected by hand, the program overlooked all those tunes. I’m thinking now that perhaps an earlier reboot of my Touch changed that setting. Otherwise, why have I not fought with it every time, or today with the Classic? Worse than this frustration, and the mild blood pressure spike such electronic brawls always trigger, is that my current brain chemistry translates elevated BP as a reason to full-on panic. My guy wanted to show off the navigation upgrade he wants to gift me for our new car’s OnStar package (since I refuse to carry a smart phone… Heh…). I couldn’t do it. I had to walk away with apology. Heart hammering and head starting to pound, I needed to jump on the NordicTrack before things got worse. Blessedly, exercise speeding my heart sort of resets the mechanics. Cooling down, my body calmed to normal. What a relief. Mr. Williams hanged himself at age 34 in 1998. 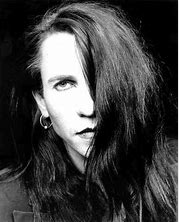 Have you ever heard of tragic American Gothic singer Rozz Williams or his musical projects? 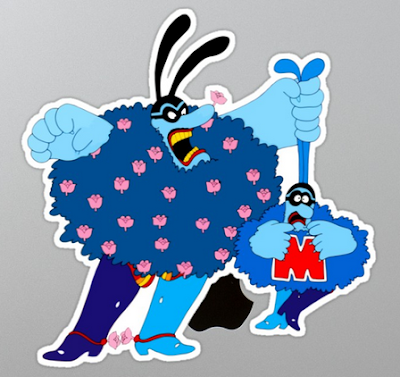 I don’t really like my nickname for our lovely 2017 replacement Volt, but decided to run with ‘Blue Meanie’ here, for now. As for an update, our newest vehicle is more a peach than we knew. Turns out we can access the newbie’s history through a Volt website. You see, my husband geeks out over my energy use statistics and sharing information with other fans. On an amusing aside, he received a message from the site inquiring over our 2014 ‘baby’ due to a lack of communication. As for this history, to our amazement the person leasing her the last three years ran the car on gasoline to a near exclusive degree. So the battery is all but brand new (!) and should serve us very well. That ’14 lost little charge capacity despite constant taxing. In all likelihood, due to the longer battery range our car will one day run a cycle that utilizes aging fuel, burning it off. In this current cold I have been using a fraction of a gallon for every five or ten mile drive, a protective mode warming the battery system. On the punny note, a friend of mine driving a standard (not diesel) Chevy Cruze calls it ‘Tom’. Get it? ~rolls eyes~ Maybe I’ll just go with ‘Baby’ again. Any better suggestions? On the subject of cats, for some strange reason crazy little Jezebel seems to like tasting my body lotion. Fortunately, Griffin Remedy Omega-3 Ultra Moisturizing Skin Food lists nothing harmful in the product. Did you know it’s possible, though not easy, to type while a cat licks the back of your hand and fingers? Yesterday we decided it time to look for a replacement electric hybrid Chevrolet Volt, a vehicle no longer in production. Our diesel Cruze sedan just isn’t designed for short hauls around town. My husband said upgrading from a 2013 to ’16 or ’17 model equated to making lemonade out of lemons following our hit and run collision last month. Using our insurance company’s online assist, he found a car through a nationwide company that delivers a vehicle right to your door at no charge. Hmmm… Sounded interesting. He reached out and a representative named Nick called. The polite fellow talked us through features on their website, specs on the selected car, and offered to get us started on the delivery process. In agreement my husband and I could handle the procedure on our own, we put on the brakes and decided to poke around first. First off, ‘free’ delivery cost $399 if we decided to keep the car. Then my smart guy thought to check the Better Business Bureau. Besides getting two out of five stars, this used car ‘dealership’ received a plethora of complaints that echoed similar issues. Among them: long overdue deliveries, filthy interiors, mechanical failures, and poor customer service. One victim tried buying two different vehicles before demanding back his trade-in. When he got it back after a long delay, his expensive speaker system had been replaced with substandard factory units. Also, the excuse of a new paint job justifying his wait proved a patent falsehood. All that, not to mention the fact our ‘suggested’ wait time on delivery was ten days, told me to move on. Did those people even have the car? I doubt it, seeing as the supposed ‘real time’ online image looked like a one car showroom. I suggested checking out local, long trusted Voss Chevrolet the next county over. And we hit pay dirt. View of a mythical car half the continent away paled in comparison to recognizing the drive-thru service bay on Voss’ website. I've stood on this floor many times arranging automotive maintenance. 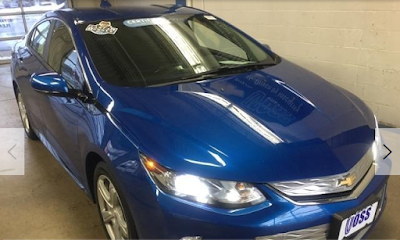 Last night we came hope with this pristine 2017 Chevy Volt LT in metallic blue with well under twenty thousand miles (!) on the drive train. I think a conscientious elderly person may have leased this car. We face a learning curve on newer technology, but that should prove interesting. I apologize for the poor image below. It was cold! At home, plugged in and charging. Do you try to shop local, whether for large or small purchases? Rooting around the cabinets for something to eat, I found this onion sprouted in the dark. So much for keeping one around, handy in case of need. Then again, I suppose we should get a proper storage bin. Taken today, March 1st, this got filed under February. Weird? No? Should I stick this in the garden and see what happens? This one’s for Ellen. Enjoy. For the rest of you, do you recognize this screen shot of Mr. Cage? Years ago, as he did twice a year for their Florida migration, my father turned over my ailing mother’s care to me and hubby for several days. She needed pain medication, so I took her shopping. Of course, she got confused. I still have a huge bottle of naproxen sodium. Oh, well. I’m blessed not to need pain relief often. And I screwed up, as well. 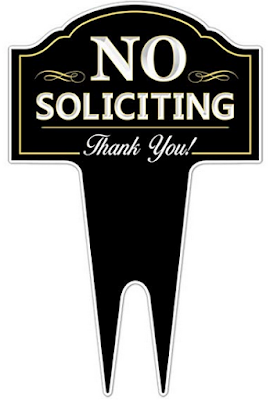 Under stress, I meant to purchase a ‘no soliciting’ sign and brought home a ‘no trespassing’ notice instead. My husband deemed the wording a bit harsh at the time, so I should have exchanged it but never did. To honor his wishes the thing got stored away. Dealing with anxiety off and on, I hate hearing the doorbell or someone knocking unless we’re expecting a package or rare visitor. Yesterday evening we sat watching an episode of the miniseries “Presidents at War” when persistent knocking sounded. I refused to go to the door even though our television carries right through to the outside, especially at the volumes my husband often chooses. A few minutes after the interloper gave up, I decided to step outside and found some guy wearing a construction vest like I’d seen on another solicitor turned away (!) a few days ago. Walking away from the house next door, he turned to my hail. 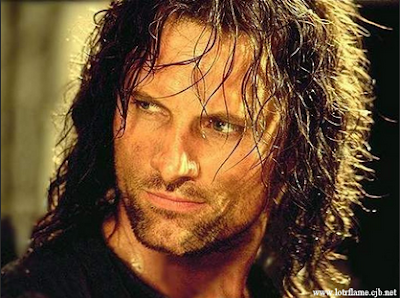 I… begged to differ, you could say. He wasted no time heading the other direction. enter the owner's land or property without permission. ‘Nuff said. I’ve asked my husband to use Amazon.com points and buy this rather attractive yard sign. I wish it included the caveat “unless you are a child” but don’t expect this will stop them, anyway. Would you approach such an unwelcoming door? Gotta love the luxury of writing in bed… No kitty companion but still nice with a little classical Ravel playing in the background. What’s your view like today? I suppose hate is a strong word. Oh, and please forgive the bad homage to “Dr. Strangelove or: How I Learned to Stop Worrying and Love the Bomb”. That movie never gets tiresome. As for the sinking feeling, our memory foam seems to have forgotten its purpose. I think the idea is to keep me in bed, not dump me to the floor. That happened with Jezebel the cat tucked against my hip when my cell phone, on the far side of the nightstand, rang. Busy writing, I first ignored it, then got a voicemail alert that always proves too distracting. So I leaned over, attempting not to disturb Jezzy, and that whole edge of the mattress sank under my elbow. She, of course, moved away while I struggled against cracking my skull upon the furniture. Good thing we have a sturdy headboard. And I’m thankful to have been alone. Going viral as an Internet gif is not on my wish list. But have you seen those commercials in which a woman jumps up and down on a memory foam bed and a full glass of wine at the foot sits motionless? Earlier that same morning, I woke up at 4am to use the bathroom. That is not normal for me, blessed with strong bladder control. But my husband tossing and turning jolted me to the point even my brain started sloshing. I can’t blame him, though. My tendency for heavy sleep has been disturbed. After the decimation of my tropical fish tank and the failure of multiple aquarium heaters (??? ), stress over keeping those few survivors alive through wild water temperature fluctuations woke me every few hours. To this day I have mild panic attacks just turning on my new digital thermometer. Changing tank water on Friday tested my heart, let me tell you. I hope that by springtime the tendency to overreact to every little thing will have faded. Have you ever seen “Dr. 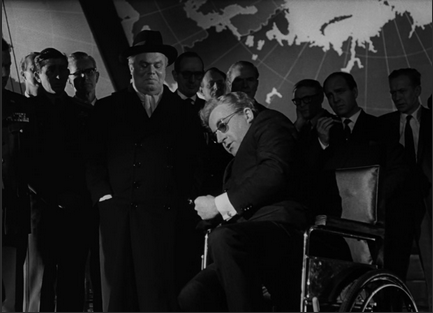 Strangelove?” Did you know that Peter Sellers cracking up his fellow cast members resulted in the scene (at top), meant to be lit brighter, being filmed in heavy shadow? 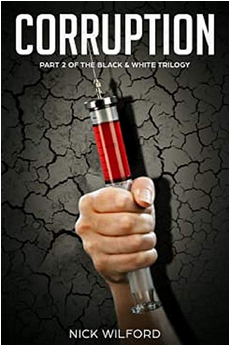 Hurray, Nick Wilford's Newest Book is Out! I hope to post a review of the book soon. Nick Wilford is a gifted writer. 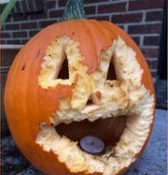 Doesn’t he have an award winning smile?